I am Shannon Menninger and I have been quilting for about 6 years now. I am not a professional nor have I written any books on quilting. I have designed one quilt myself and completed it. I sent it to my husband while he was stationed in the Middle East. I started quilting when my sister and I walked into a great shop in Chesapeake, VA called The Quilting Bee. All the quilters there were so helpful, whether they worked there or not. It is now the shop by which I judge all others. My first class was a rail fence quilt over the course of 6 weeks. Before the 6 weeks were up my sister and I had taken at least 3 other classes. After the first class I was hooked. My sister and I finished quilts for at least 5 people by the end of that first year of quilting. Addiction is too kind of a word for the way I feel about fabric and quilting. I have fabric everywhere. I have so many UFOs that I don’t even know where to begin with them. I have projects that I never began, but I have organized in a ready to start kit. I have projects that are halfway done and quilt tops waiting to be basted and quilted. I have projects that are already cut, waiting to be sewn, and I have projects that other people gave me because they were never going to finish them. And I have 5 complete BOMs that I haven’t even done the first block yet! And I haven’t even mentioned patterns or books yet! The highlight of my quilting experience so far has been to go to the Houston Quilt Show this past fall. I met Eleanor Burns! I used to watch Quilt In A Day with my grandmother when I was younger, she actually videotaped every episode. I think I still have them in my garage. 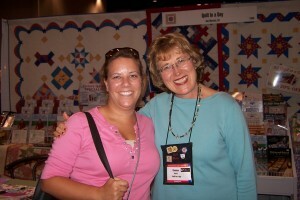 I have a ton of her books, which are great for all levels of quilters. I made a Delectable Mountains quilt for my grandmother that turned out beautifully. I’ve also made a tulip wall hanging and a log cabin quilt from her books. She is so pleasant and willing to talk, she even introduced me to her son (she used to talk about him on her show). I’d love a chance to win a spool of King Tut. White or off-white, please, if I’m lucky enough to be selected. Thanks! You need to enter the King Tut contest on Shawn’s blog.